Saturday, May 21, 2016 from 12:30 p.m. to 5:00 p.m. The fifth annual SCI Wellness Summit welcomed 160 visitors on Saturday, May 21 to learn about the wonderful world of assistive technology (AT) for making life a little better for individuals with spinal cord injuries. Workshops, demonstrations and presentations covered everything from quick do-it-yourself AT solutions to the latest in emerging technology, including 3-D printing and robotic devices. The Summit took place at the UW's South Campus Center. 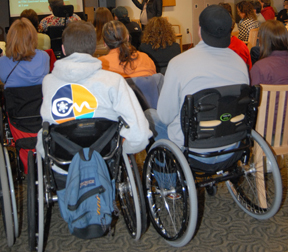 This annual half-day educational symposium is presented every year by the Northwest Regional SCI System and the SCI Transitions and Wellness Program in the University of Washington's Department of Rehabilitation Medicine, and attracts consumers, caregivers, clinicians and rehab students from around Puget Sound. Thanks to our underwriters, this event was free to the public. Technology is affecting the lives of people with disabilities in surprising and revolutionary ways. Technologies developed for mainstream use and gaming, such as touch screen computing and body-tracking motion controllers, have changed computer access for individuals with disabilities. Wearable devices help monitor health needs, store data and deliver feedback. “Sixth Sense Technology” allows users to interact with devices and information via gestures. Telepresence robotics, Smart Home technology, speech controlled devices, and 3D printing are all new technologies that are changing independence and function for people with disabilities. The speakers will delve into these and other technologies as well as some of their ethical implications. CEU Credits: .75 contact hours. The Maker Movement borrows from the ethics of Do-It-Yourself (DIY) culture and hacker culture to offer new options for individuals with disabilities. Off-the-shelf AT is often extremely expensive and uses a generic, one-size-fits-all model. Making your own AT is surprisingly cheap, easy and fun and allows for complete customization. Many people stumble on great ideas for AT solutions that could improve their own lives, yet have no idea how to make their ideas come to life. You’ll leave this presentation with a basic understanding of DIY switches, Bluetooth and USB interfaces, and environmental controls. CEU Credits: .75 contact hours. Many individuals have been solving their independent living, work or educational problems through their own ingenuity and materials they find available at home or locally. We will expand on that and explore improvements in positioning, stabilizing or affixing assistive devices that range from "high tech" to "low tech." With funds becoming more difficult to obtain for issues related to SCI, it is imperative that individuals and families become knowledgeable and share these low cost solutions. We will focus on functional outcomes through use of local resources when funds are not available for the high tech options. CEU Credits: .75 contact hours. Brain Computer Interfaces (BCIs) have the potential to improve human function by allowing users to control devices or communicate using brain signals directly, bypassing damaged nerves. 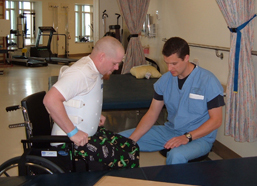 Dr. Jared Olson MD is a practicing physician in the University of Washington Department of Rehabilitation Medicine and a BCI researcher affiliated with the Center for Sensorimotor Neural Engineering, with a focus on human BCIs. He will introduce BCIs and touch on currently available technology and research in the media, and will discuss the challenges facing widespread adoption. CEU Credits: .75 contact hours. 3D Printing—See what others with SCI are making with this technology. Computer Access —The latest in interfacing with your devices. Digital Assistants—Amazon Echo and others. vHAB—A platform that uses sensors to monitor hand and arm function throughout rehab, makes doing therapy fun! Washington Access Fund—Help and loans for acquiring needed AT. Assistive Technology (AT) has the potential to vastly improve functional capabilities, independence and quality of life. 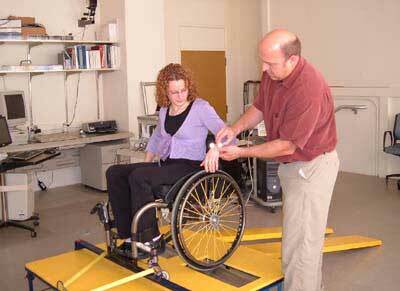 Yet there are numerous hurdles to obtaining assistive devices in the U.S. today. Even once those hurdles are overcome, the rates of acceptance of AT are very low and rates of device abandonment are high. Anat Caspi, PhD, Director of the Taskar Center for Accessible Technology (TCAT), will explain why individuals with disabilities face so many barriers to getting the AT they need and want. She will then describe ways they can become involved in creating and modifying their own AT through the Do-It-Yourself Assistive Technology (DIY-AT) movement, rather than being forced to rely on "off-the-shelf" products. Finally, she will identify places in Seattle and beyond where people with disabilities can participate in DIY-AT. CEU Credits: .75 contact hours.